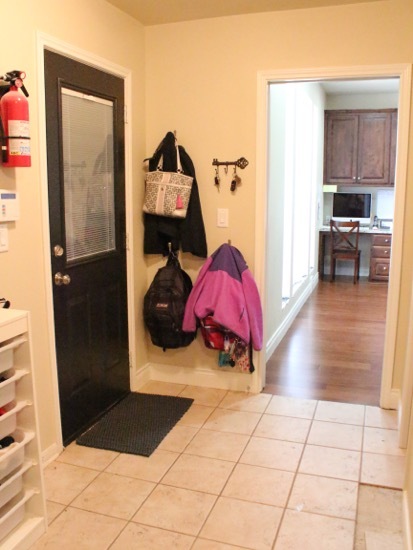 I’ve been putting off doing any permanent storage in our mudroom/laundry room. 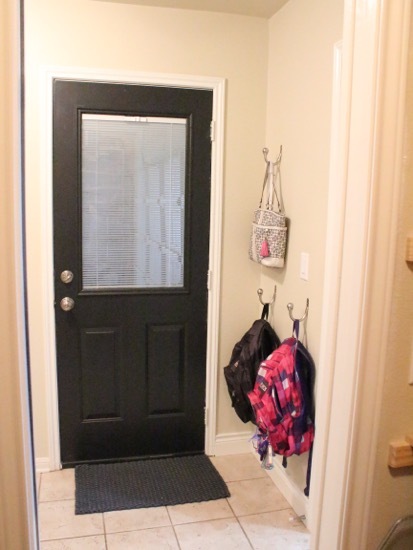 I’ve been holding off; wanting to wait until I can install the mudroom of my dreams, complete with lots of storage, a bench to sit on, and hooks for backpacks and coats. Well, we’ve been here a year and a half, and this is just not a practical goal. 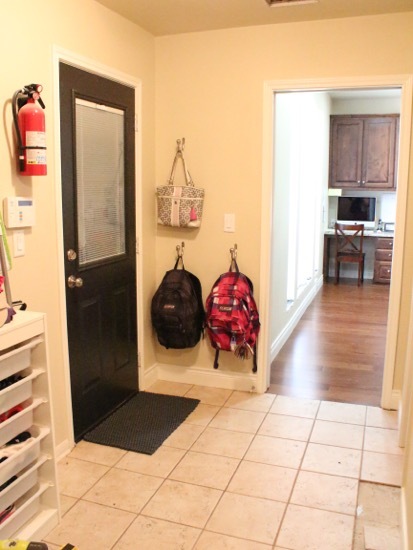 Backpacks and coats have been strewn all over the floor, and the kids have started avoiding the mudroom completely and dumping all their bags, books, coats, and shoes in my dining room every day. Enough is enough! I created a temporary (but probably less temporary than I’d like to admit) solution for all their stuff. 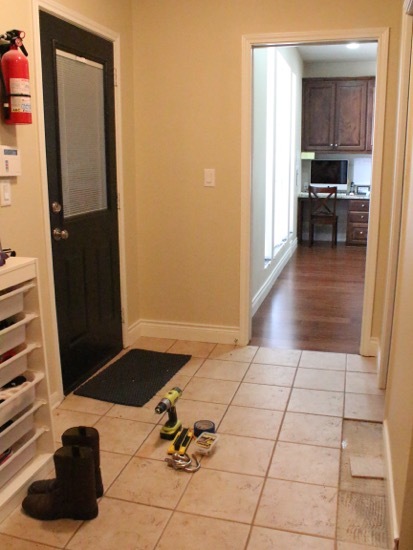 Here is the view into the kitchen from the mudroom. On a side note, just ignore the missing tile on the floor. It got removed during renovation to install the new pocket door in the pantry, and I just haven’t bothered laying new tile yet. I have the new tile, after rescuing it from the Habitat store that I accidentally donated it to, but in all honesty, I’m just not that motivated to patch it up. I don’t even like the floor to begin with, and I hope to replace it someday, so I’ve just been avoiding it all-together. The black door on the left is the door into our garage. 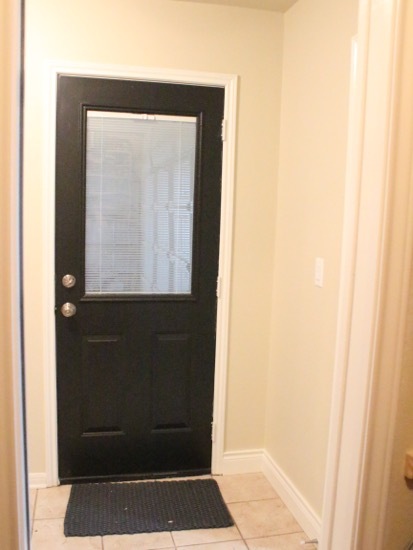 The door is set away from the perpendicular wall just enough that there is enough space there for some wall hooks. 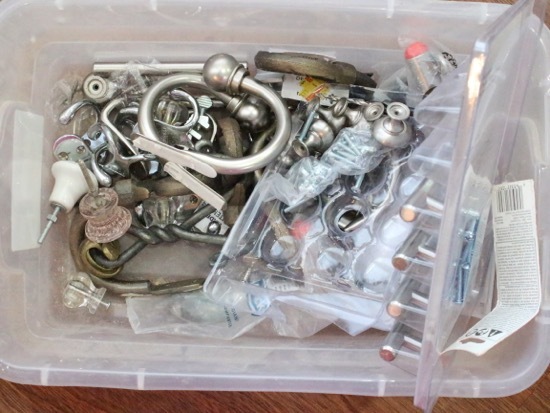 I have this random bin full of all sorts of hooks, knobs, and the like, so I rummaged through it to find some hooks to hang on the wall. There on top were some old curtain tiebacks that I forgot I saved. Thrifty Decor Chick used curtain tiebacks on her door for bags and scarves, and I’ve always loved that idea, so I tried it out for our backpacks. I used my new handy dandy stud finder that Ben got me for Christmas (it was on my wish list!) and because the studs were reasonably placed, I screwed directly into them instead of using anchors. 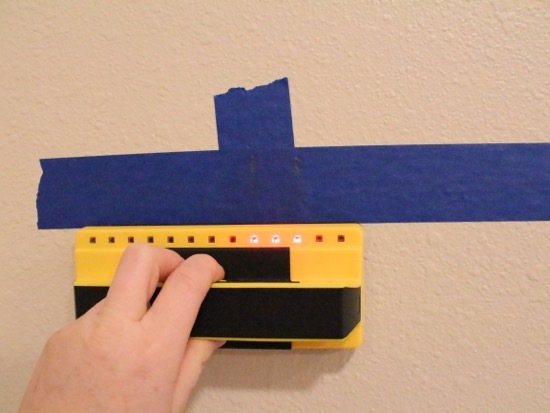 A quick tip: if you ever need to hang anything on your wall, or do anything on your wall that requires any pencil markings, put painters tape on your wall first, then do all your markings on the painters tape. You can drill or screw directly through the tape, and once your screws/nails are set, just rip the tape off. Now you don’t have to touch up any paint to cover all the pencil markings. Once the 3 hooks were installed I tested them out with the heavy backpacks and my purse. AWESOME. Finally! Storage. And it only took me 10 minutes using stuff I already had sitting around. Why did I wait 18 months again??! 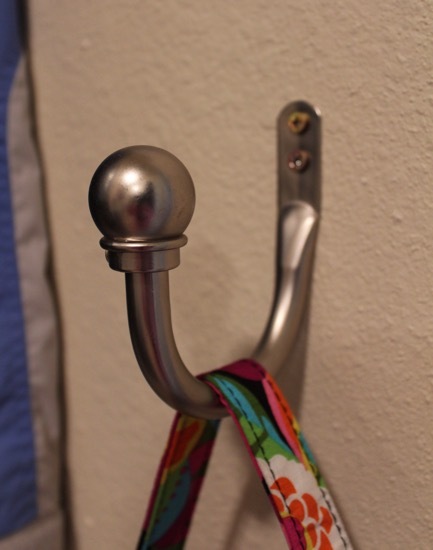 The hooks and bags fit snugly behind the door without blocking the door from opening all the way. It’s like it was meant to be. 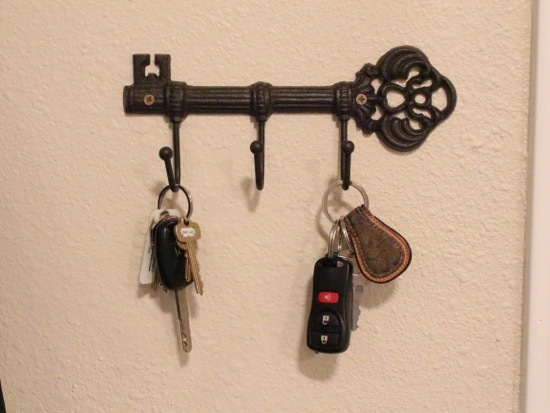 I also found this cute cast iron key hook at Hobby Lobby that I hung up. Now we can all stop calling it wrought, and start calling it what it really is – cast iron. You are welcome. And finally, our new curtain tieback wall hooks working double duty with our bags and coats, and the new cast iron key holder. Hallelujah for simple storage solutions that make a big impact. My goal for 2015? 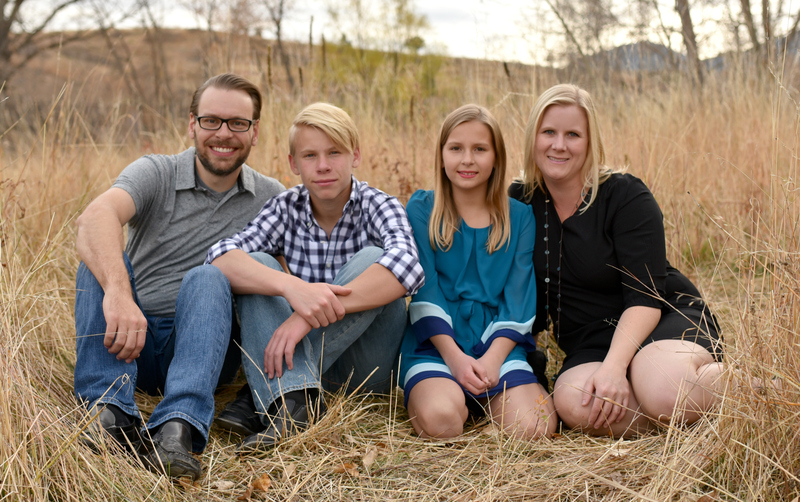 To get this house organized once and for all. Looks amazing.. And I have the same goal for 2015 Organize my house.. I have all the items lying around to do it, just doing it is the problem..lol. Neat ideas! And at least you didn’t call it rod iron. j/k. I read about the tile donation. Oops! But lucky you got enough back to do the patch work. Although if you hold out just long enough…You just might get to replace the whole floor then you can re-donate them all. 🙂 Seeing the box of all the hooks and knobs made me remember that the container I bought to put all my extra’s in is still sitting empty. I’m off to do that now. Happy Monday! Simple, effective, awesome! And as for the painters tape tip, how did I never think of this before? Thank you! Looks great! This is an eternal struggle of mine… We entire directly into our living or dining rooms with no closets or room for storage by the doors. I have hooks but I need more to house the winter coats, snow pants, backpacks and all other winter gear! Usually they are all over the house to dry out anyways but it drives me batty! What Wisconsin house doesn’t have closets?? Love the tie backs for books! Thanks for the attractive & handy tip! Huh… once again simple ideas are best. Nice work! And that painter’s tape tip? Genius! Why didn’t I think of that?… last Saturday… The REALLY dumb part: my “touch-up paint” was a different gloss than my original wall paint… and I “touched up” walls in something like 9 different spaces in the house. Guess who’s going to be doing a LOT of repainting. Great idea…so simple and looks great! Thanks! I love the reuse idea. It makes so much sense when you can do it and have a bin of odds and ends to choose from.